Kananginak Pootoogook (1935-2010 Kinngait). “The First Tourist,” 1992. Lithograph 57 x 71 cm. All images © Dorset Fine Arts. Kananginak Pootoogook began his career in Kinngait, a hamlet in Nunavut where a collective studio, the West Baffin Eskimo Co-operative, has grown since the 1950s. 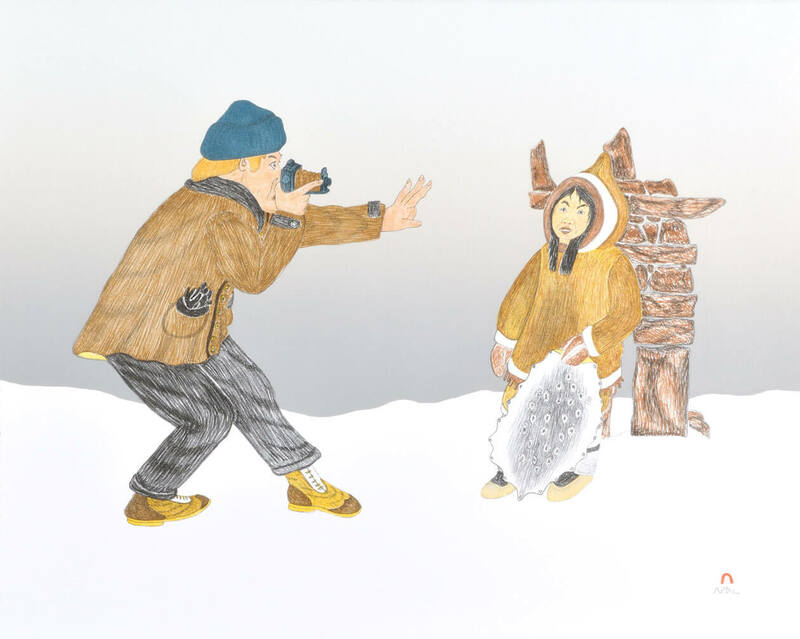 It has created some of the best, yet too often overlooked, prints and drawings in the world, and Pootoogook was one of the studio’s first artists. He made images of wildlife for some forty years, and his depictions of birds were so prolific and proficient they earned him the nickname “Audubon of the North.” And then, he changed subjects. Pootoogook began turning away from meticulously detailed owls and ravens, and, from the early 2000s until his death in 2010, focused on the changes that he witnessed in Nunavut over the course of his lifetime. For someone born in 1935 in Ikirassak, a small hunting camp on southern Baffin Island, these shifts were immense. The resulting drawings are a gripping depiction of colonial contact, with images of missionaries, RCMP officers, and traders among them. The new work surprised Pootoogook’s collectors, but didn’t deter them. So he made more. And now, this late-career change has attracted unprecedented international attention. Ten drawings by Pootoogook, created between 2006 and 2010, are on view in the Venice Biennale’s main exhibition, Viva Arte Viva, which opened to the public on Saturday and runs until November. Pootoogook’s inclusion has surprised even his most ardent supporters, but, more importantly, it has made history: this is the first time in the Biennale’s 122 years that work by an Inuk artist has been included. It’s a familiar story for Inuit art, which is too frequently underappreciated or dismissed as craft­. Inclusion within the Biennale marks a long-deserved moment of recognition, one that has only ever been achieved at this level by the trailblazing Annie Pootoogook, Kananginak’s niece. She “permanently transformed the landscape of Inuit art by breaking through the ‘ethnic art’ glass ceiling and firmly establishing contemporary Inuit art in the mainstream when she won the Sobey Art Award in 2006,” art historian Heather Igloliorte wrote when reflecting on Annie’s legacy after her death last year. Annie also showed at the international Documenta exhibition (arguably the only art event more significant than the Biennale) in 2012. Inside the Arsenale building, where Pootoogook’s works are being displayed. 57th International Art Exhibition—La Biennale di Venezia, Viva Arte Viva. Photo by Italo Rondinella. Courtesy of La Biennale di Venezia. Million-dollar installations and Aperol spritzes are a prominent feature of the Biennale; Inuit art, until now, has not been. To get to Venice, Kananginak Pootoogook had to go through New York. 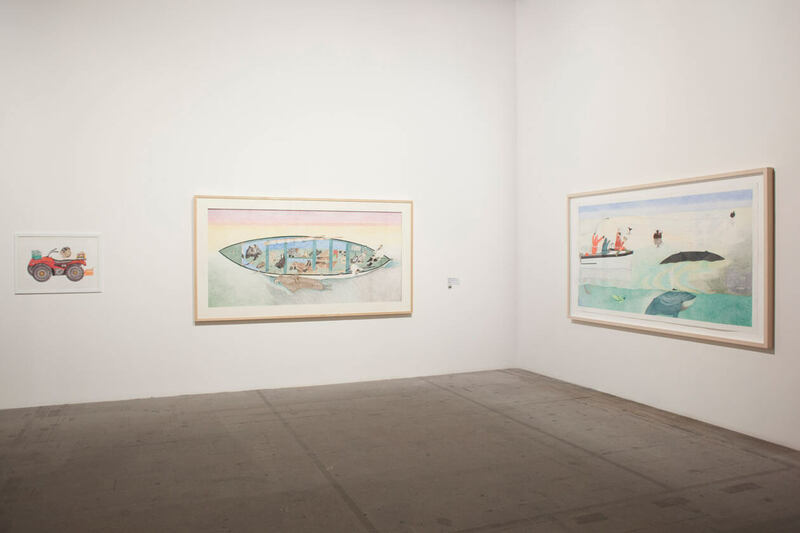 His drawing of a walrus hunt was on view for much of 2015 at the Brooklyn Museum, where it caught the attention of Christine Macel, a Parisian curator and the organizing force behind this year’s Biennale. The 2017 event consists of a main exhibition, which is split between two large buildings and divided into smaller thematic sections (each a separate “pavilion”), and a series of national exhibitions, organized autonomously by individual countries and housed in pavilions scattered around Venice. Macel was struck by the hunt drawing, and remembered seeing Annie Pootoogook’s Documenta work years ago. She started digging deeper. “When I discovered all the work he created, especially in the last years of his life, I wanted to give him some attention,” Macel said. She has carved out a space for him in the middle of the immense brick Arsenale building that houses a portion of Viva Arte Viva. Pootoogook’s works are on view in a section of the exhibition titled the “Earth Pavilion,” which makes sense—walrus hunts don’t happen just anywhere—and yet the vitality of the drawings does not lie strictly in their depiction of the environment. Only a minority of the pieces include details of landscape. Instead, their strength comes from the relationships and activities that they depict. “It’s very important to encourage people to remember that Inuit culture is a living culture—not something that happened in the past,” Campbell said. And Pootoogook’s work perfectly manages this. There are images of figures frustrated with broken down ATVs, or a self-portrait of Pootoogook and his wife, Shooyoo, sitting on their light blue couch at home. These intimate, everyday moments exist alongside whale hunts and bureaucratic confrontations with the RCMP. “I’m pretty sure people around the world still think that Inuit people still live in igloos and things like that, so I’m happy that people will realize that we are living a current lifestyle,” says Joemie Takpaungi, who worked with Pootoogook at the printmaking studio, when asked about the Venice showing. But the most fascinating element of the work on view in Venice is Pootoogook’s careful nod to the audience. He knows we’re there, peering in at the glimpses of life and community that he offers. Take a 2009 drawing of a wolf, which includes a self-portrait of Pootoogook reaching into the composition, pencil in hand, at work on the image itself. Or, in his 2009 depiction of a whale hunt, look at the character riding on the front of the boat, a video recorder grasped in hand, capturing the event for later consumption. These are small moments, but they tie into one of the richest aspects of Pootoogook’s work: a close study of the ways in which Inuit culture was represented, both by members of that community and by outsiders.